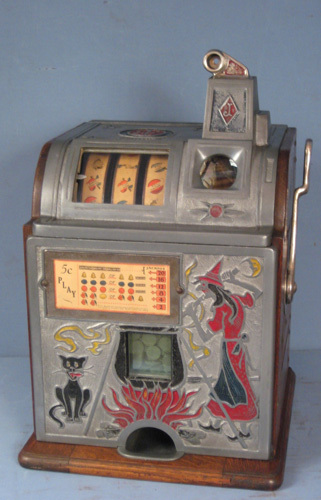 Serial numbers for Many Mills Slot machines especially postwar are located in the back of the middle of the machine stamped in the wood behind the notch where the back door inserts. Many times this area received wear and some number are worn off. The serial number is also on a paper label on the left hand side of the machine case. The two sets of numbers will always match as this is how they did it at the factory. The numbers were also stamped north and south like you would read them, they were never factory stamped with the number laying down and running in a east west direction. If you have a set of metal number punches you could stamp serial numbers in the back of the wood case and I have seen this done when the wood base was replaced on a machine with a damaged base or a damaged base was missing numbers. 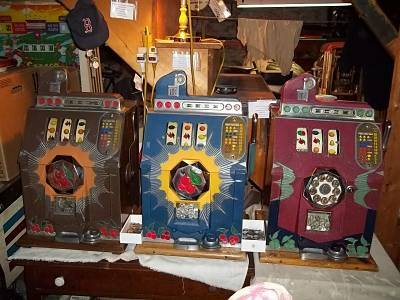 I have repaired hundreds of mills slot machines including ones that were so new only the crate was missing. The paper label on the mechanism is a mechanism label and is just that the number of that mechanism it does not match the stamped and printed number on the case. Why is that you. may ask? The reason is that Mills would sell extra mechanisms and did not worry about the number on the mech matching the case. In over thirty years and hundreds of slot machines I have never seen a regular factory machine that had a matching case and mechanism serial number. On the early black cherry machines only, the manufacture date is date stamped with a purple ink on the flat part or the jackpot, not on all black cherries just some. This being said, Jennings machines especially the chief series stamped the mechanism at the back right in the metal of the back of the base. The case also had a serial numbers printed on it and these numbers were matching when the mechanism and the case left the factory. So in summary , you can tell on a Jennings machine when the mechanism is original to the case, but on a mills machine the only way to tell is the fit of the mechanism to the case. If your mechanism slides into the case and the base lockdown bars fit nicely on the right and left side and the escalator lines up, you probably have the right mechanism. The mechanism numbers is usually around 20,000 numbers higher than the case number on a mills machine. The last tell will be the color of the reel strips, black cherry machines had silver strips, golden falls machine and Paige boy machine came with gold strips. The hightop machines with the 777 strips came in silver. The token bell machine came with black strips. lots of great info there, montanna. thank you! I have been searching for this information as well, as my mec serial numbers don't match the stamped serial numbers on the Bursting Cherry series that I have collected. I do have an additional question regarding the stamped case serial number on my Brown Front. It reads 307516, which according to Bueschel's book, puts it around 1932. The Brown front did not get produced until 1937. It does not share the casting with the earlier machines. Factory mistake, or another reason? The stamping appears original to me.